Berlin, to me, had an interesting mix of high efficiency and order that you'd find in a place like Japan, mixed with that wild and free vibe that you could feel in the States. Germany, particularly Berlin, always seemed intimidating to me at some level due to the history, as dumb as that may be. I quickly found a lot of things about the city that I liked however, like the balance I mentioned, and I was able to have a really good stay. I visited the city with a couple of friends while on a trip around Europe together in 2012. We arrived at Berlin Central station by ICE train in the evening, coming in from Brussels. From there, we caught a train to Senefelderplatz station where we had rented an apartment to stay at through Pfefferbett, a hostel that also rents out properties that they own in the area. Despite having some key problems, the apartment was located conveniently near two stations, was quiet, and nicely decorated. There was remote window blinds in the master bedroom, and the apartment had large glass doors that either opened up to a fairly large balcony or could be vented slightly as windows. On our first full day, we joined a free Sandemans New Europe walking tour that started at Brandenburg gate (it seems that many do). Our guide was actually a British expat who fell in love with the city and never returned home, learning a lot of interesting facts during her stay so that she could provide us with some amazing information about the things we saw. Some of the sights we visited were the Holocaust Memorial (below), the last Nazi building which became a tax office, Checkpoint Charlie (which is quite touristy), Bebelplatz memorial, the purposely regular parking lot where Hitler's bunker used to be, and finally ended up at Museum Island. Even though it was a free tour, most of us gave a tip because of how informative she was. The Holocaust Memorial, beautifully designed and very impactful. The Berlin Wall at the Topography of Terror. Fall leaves on Museum Island. Berlin was relatively easy to get around on our own once we finished the tour. A lot of the main tourist spots are within walking distance or easily accessible by train. The city is big but not overcrowded, and it's quite clean. Even the public restrooms are clean, really clean actually, although you do have to pay a small fee to use most of them (makes sense). We decided to check out the iconic TV Tower one evening. Before heading up, we ventured around the neighboring Alexanderplatz station, where there was a small open market with shops and food stalls selling local eats like deep fried potatoes with applesauce. To end our day, we went to grab a bite of currywurst (a German fast food dish - sausage with ketchup and curry powder) at CurryKultur, a random outdoor eatery nearby our apartment before heading to Qum Bar, a hookah/shisha bar right down the street from it. The next day, we roamed the city on our own to sights such as the Reichstag government building and the Berlin Wall at the Topography of Terror where you can learn everything about the Nazis and what they did. 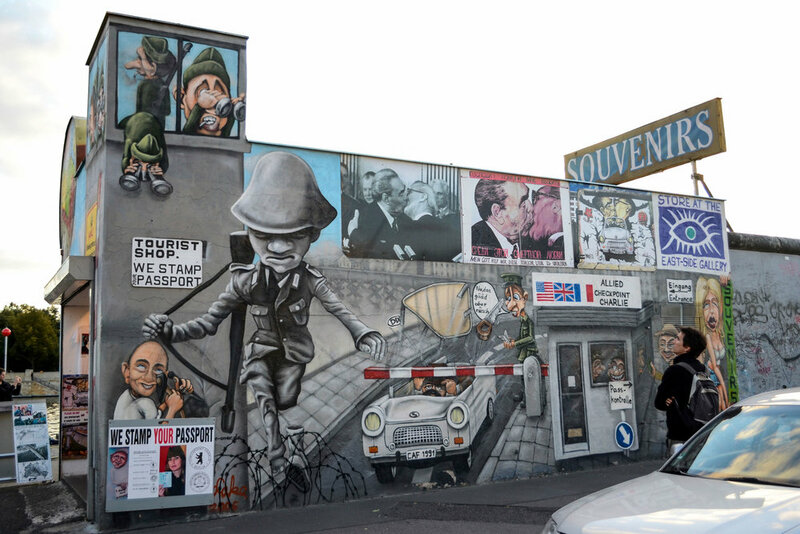 We later headed out to the Friedrichshain area, a more hippie/bar type of neighborhood, to see the Oberbaumbrücke Bridge and the East Side Gallery of the Berlin Wall. Oberbaumbrücke Bridge and artwork from the nearby Eastside Gallery below. We went to a REWE - a supermarket near our apartment. It's always interesting to check out a local supermarket to compare with your own. It was pretty big, and it resembled an American market pretty closely - brightly lit, spacious, well air-conditioned. Prices seemed to be quite cheap as well. After picking up a few supplies, we went to catch the last few minutes of an outdoor street fair near Brandenburg Gate that happened to be the celebration of the Berlin Wall's takedown. Big bratwursts, beer and Jäger on tap. I wish we had at least another day or two in the city. There was definitely a lot more to see and experience. I'll just have to put it on the list of places to go back. A Turkish restaurant that we randomly sat down for a late lunch at. It's off the main street, so it's quiet with a little bit of outdoor seating. The food was tasty, nicely presented and the service was decent. Nice hearty German food that was nearby our apartment. Sausage, pork, chicken, some green beans and a baked potato. The atmosphere of the restaurant was almost like a dimly lit home.